In the spirit of Oscar season, we do well to look back at what the 2017 ‘Academy’ ignored. One such film is this fall’s Wind River, the directorial debut of Tyler Sheridan. As the scriptwriter of 2016’s acclaimed Hell or High Water, his subject matter of white plight in small-town America elevated him to the likes of Hillbilly Elegy’s J. D. Vance and other bridge-makers between coast and heartland, between forlorn Trump voter and aloof elite. And this praise is well-earned. For some time there has indeed been a dearth of films concerning the red-state heartland—excepting Jennifer Lawrence’s work in Winter’s Bone that still overshadows all her subsequent films, Terrence Malick’s rhythmic To the Wonder, and the two television shows, Justified and Rectify. Sheridan fills this void with the steady eye of one who knows such places. He writes his plots with a suspicion towards all things big, whether distant federal agencies or greedy corporate bureaucracies, and he pens characters and their events with a realistic mourning of the past and its surreal sense of tragedy, the kind which seems both inevitable due to machinations of time and yet so avoidable had only those involved just done what is right. This writing translates well into Wind River. The film is closely shot, intimate—a cinematography that buttresses Sheridan’s own focus on dialogue. Though filled with violence and gore, the film’s most brutal moments come during sobbing laments of fathers and teary diatribes of scoundrels. And the story culminates in an emotional ending which warrants all the nastiness preceding it. But one line of dialogue, one unspoken by any character but which simply pops on-screen at the end of the film, almost undoes all good done by Sheridan in his debut. 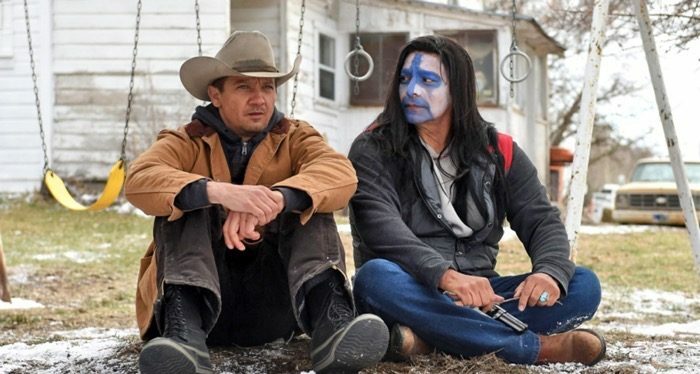 The protagonist, Corey Lambert (played by Jeremy Renner), a stoic hunter acquainted with death and grief, visits his friend Martin (Gil Birmingham), a Native American father of a daughter raped and murdered whose investigation has been the plot of the film, as well as a son recently jailed. Lambert finds him sitting in the yard, legs crossed, face painted, pistol in hand. When asked what he is doing, the father explains something of a ‘death face’ he does not actually know since his people’s traditions have been lost. He had planned to commit suicide due to the unbearable grief of his daughter’s death, but a hope stops him: a call from his son asking to pick him up from the sheriff’s office. Thanks to Sheridan’s earlier development of the son, this action bears hint of redemption. But first, the father must grieve. He asks his friend to just ‘sit for a minute.’ Lambert complies, himself looking as if he needs such a minute. And they do so. The minute has potential to lend credence to the director Nicolas Winding Refn’s maxim that ‘silence is cinema.’ In all respects of cinematography, it meets this potential. The camera stays in its place, and Sheridan allows the breeze of the wind and the rustling of the grass to echo the silence. Two men, torn by tragedy while staring off into the Rocky Mountain distance as the grass withers and cars pass, show a glimpse of authentic masculine grieving, free of pretense or kitsch. —Or, such would be what we see, if not for a white caption obstructing the image. In bold letters reads a factoid that the FBI still has no classification for missing Native American women in their system and thousands are still missing. The caption takes up the center of the screen, and so one cannot see the beauty of the shot behind it. Perhaps Sheridan hoped his well-crafted art, crowned with an informatory call to arms, might spur on a mite of activism. But this ideal, though noble, actually undermines Sheridan’s true success: his simple but deep word-craft, his patient character development, and the work of his cinematographers, all combined into a scene of stoic grief that would have reached the heights found in any Coen film or McCarthy novel. And this undermining happens literally: Sheridan covers his own work with a public service announcement, fading in a giant text more distracting than any text-messaging that may have taken place during the film’s viewing. It is evidence of a budding artist not yet confident his story on its own will give all the political punch needed—though it did. No other film since the aforementioned Winter’s Bone was so effective at depicting the plight of dying America, and that film did not so masterfully depict the plight of Native Americans. Sheridan’s mistake reflects larger cultural tendencies. This past ‘awards season’—we thus define parts of the year now in lieu of actual cycles of creation—has consisted of protests against sexual assault, suggestions of presidential candidacies, all of which, following a massacre in Las Vegas and a hurricane in Puerto Rico, are already quickly fading from memory after their allotted weeks of ‘national conversation,’ now only to make way for yet another massacre and its rants over thoughts and prayers and gun control. It is telling that in this most politically active of eras, little activity happens. We demand every solution yet solve nothing. In our immediate age, we do not ‘sit for a minute.’ We do not solve our plight, because we do not grieve it. It is in grieving that we grow intimate with the state we are in, and in this intimacy begin to learn its way and thus how to answer it. Without grief, we overreact to our situation, and we delude ourselves into believing that such illusions like electing yet another reality-show charlatan may be our answer. And then, when we tire of that moment of elation, we soon move on to the next problem and next response, all the while solving nothing left behind. Sheridan’s aforementioned Hell or High Water is illustration enough: after its four Oscar nominations and Trump-induced fame, it has almost totally faded from the cultural memory. And now, no one apparently thought Wind River worthy of culture-pontification pieces, as it has received little critical attention. Miguel de Unamuno writes in The Tragic Sense of Life that “we should solve many things if we all went out into the streets and uncovered our griefs, which perhaps would prove to be but one common grief, and joined together in beweeping them and crying aloud to the heavens and calling upon God.” A sign of health in this country, and a sign of health in Sheridan’s next work, might lie in doing just so. We may imitate the wisdom of the two men at the close of Wind River, who are content to let the solution come a little later, and we may accept our overwhelming finitude and so catch our breath. Hopefully, we might refrain from filling this time with text—or at least wait to do so until the screen goes black. 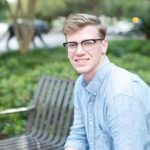 Casey Spinks is a seminarian at Beeson Divinity School. A native of Baton Rouge, LA, he earned his B.A. and M.A. in philosophy at Louisiana State University, where he wrote his thesis on the relationship between Martin Heidegger’s ontology and Protestant theology. He has contributed essays to The Imaginative Conservative, Christianity Today, and VoegelinView. He is also an avid birder and occasional carpenter. Tha k you for this. I also thought Wind River was an excellent movie, worthy of far more attention than it received. I’d love to see more attention to movies and the arts at FPR–I think there have been a number of movies in the last few years that would appeal to localist values. For instance, has anyone seen the movies Paterson or Columbus? They’re very much worth your time, and perhaps a write-up. I haven’t yet seen Columbus, but I have seen Paterson. Its subject matter, from its plot to its consistent, repetitive cinematography which buttresses that plot, is certainly in line with FPR ideals. And what makes that film even more interesting is its local setting in an urban, relatively fast-paced, multiracial community in the northeast—not exactly where I would first point such a film taking place, but all the more interesting because of that. I am watching Wind River again and so I found and read this article. It is truly an Amazing movie and this is a very insightful article. Thank you.